The new Mercedes-Benz E-Class boasts all-round safety, outstanding comfort, and up to 23 per cent fuel savings - from 53.3mpg and 139 g/km CO2. With more than 20 technical developments, this saloon further consolidates the leading position of Mercedes-Benz in the luxury class. They include trailblazing innovations for safe driving that are available from no other manufacturer worldwide in this combination. Examples include the standard attention assist, optional adaptive high beam assist, and automatic emergency braking, which is activated when there is acute danger of a collision. Mercedes-Benz has improved the already exemplary long-distance comfort of the E-Class using intelligent bodyshell technology with up to 30 per cent greater rigidity, improved seats, and a newly developed suspension with shock absorbers that automatically adjust to the current driving situation. The optional airmatic suspension now works together with an electronic damping system. The outstanding safety and comfort of the E-Class are matched by its environmental compatibility and economy: the nine available engines are direct-injection units, and consume up to 23 per cent less fuel than before. The combined consumption of the new four-cylinder diesel engines is 53.3mpg, which corresponds to 139grams of CO2 per kilometre. All the engines for the new E-Class meet the EU5 emission standard. Apart from the engines, the Blue Efficiency (standard on all UK cars except the V8s ) package for the E-Class is largely responsible for an average fuel consumption improvement of 3mpg. Engineers from every development department have worked together to optimise numerous assemblies and components, to save fuel by means of reduced weight, a new shape, improved functioning or efficient energy management. The work done in the wind tunnel was particularly successful, resulting in a drag coefficient of only 0.25, making the new E-Class the world’s most aerodynamically efficient luxury saloon. It betters the already good Cd figure of the preceding model by another four per cent. Other Blue Efficiency measures include newly developed tyres with up to 17 per cent lower rolling resistance, need-related and therefore energy-saving control of the alternator, fuel pump, air conditioning compressor and power steering, and the ECO start/stop function (from late summer 2009 ) which switches the engine of the new E 200 CGI off when idling. Displays in the speedometer inform drivers how much fuel is being consumed (mpg ), and when they should shift to the next higher gear in the interests of an economical and environmentally conscious driving style. For more than 50 years, saloons in the E-Class range and their predecessors have been acknowledged as trendsetters in the safety field. The new saloon continues this tradition with an unrivalled combination of the latest assistance and protection system whose concept and development are based on what actually happens during accidents. The new E-Class is the first car in the world with headlamps that adapt to the traffic situation and respond automatically to avoid dazzling other drivers. The optional adaptive high beam assist uses a camera on the windscreen to recognise oncoming traffic and vehicles moving ahead, and controls the headlamps so that their beams do not reach the other vehicle. This achieves the best possible road illumination in any given situation. The range of the dipped headlamp beams can be extended from 65 to up to 300 metres. If the road ahead is clear, the system performs a gentle transition to high beam. The lane tracking package for the new E-Class includes blind spot assist, and as a new development, lane keeping assist seeks to prevent the vehicle from leaving the lane unintentionally. When the system recognises the car is drifting from its lane, the driver is prompted to take countersteering action by brief but unmistakable vibrations of the steering wheel. 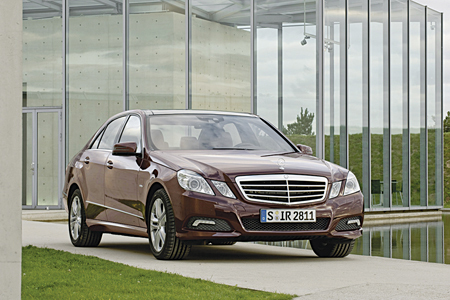 Night view assist from the S-Class will also be available as an optional extra from June 2009 for the new E-Class. Mercedes-Benz has improved this system with a special pedestrian detection function: as soon as night view assist PLUS recognises pedestrians ahead of the car, they are highlighted in the onboard display to provide a greatly enhanced warning effect. Thanks to innovative technology, the new E-Class has developed a highly sensitive means of monitoring drivers’ attention level, and warns them of drowsiness in good time. This new attention assist drowsiness detection system, which is standard equipment, is equipped with highly sensitive sensors that continuously monitor more than 70 different parameters. The well-proven, radar based assistance systems from the S-Class are now also optionally available to E-Class customers. A further development of the long-range radar sensor now has a range of 200 metres (previously 150 metres ), and is able to monitor the mid-distance so that dynamic events such as a vehicle ahead suddenly pulling out to overtake can be detected even more effectively. The two wide-angle short-range radar sensors, which have a range of around 30 metres, continue to be included in the system. The radar-supported systems are able to assist the driver with emergency braking. Their sensors are linked to the brake assist PLUS system, which automatically calculates the braking pressure to prevent a collision in critical situations. The driver is given an acoustic and visual warning at the same time. When the brake pedal is depressed, the system immediately activates the calculated level of braking assistance. If the driver fails to respond to the warnings, the radar system first initiates partial braking action. As a second stage, if there is still no driver response and a collision is unavoidable, emergency braking is initiated. This can considerably lessen the severity of an accident, ie, the system acts as something like an "electronic crumple zone". During the course of its development, the new E-Class was subjected to more than 150 high-speed crash tests and a total of more than 17,000 realistic crash simulations. The crumple zone principle invented by the Mercedes safety pioneer Béla Barényi has been continuously improved by the engineers in Sindelfingen. The front-end deformation zone of the E-Class acts on four independent levels, and is even more effective than before. The increased use of highest-strength steel alloys also helps to ensure that the bodyshell is able to withstand high impact forces. Around 72 per cent of all the body panels are made from these high-tech steels – yet another unrivalled figure in passenger car development. With nine airbags as standard, belt tensioners, belt force limiters, crash-responsive head restraints and ISOFIX child seat attachments, the new E-Class has even more extensive safety features than the preceding model. Another new feature is the active bonnet, which is a continuation of many years of commitment to pedestrian protection on the part of Mercedes-Benz. Another standard feature is the preventive occupant protection system PRE-SAFE®. In potentially hazardous situations this reflexively activates precautionary protective measures for the vehicle occupants, so that the seat belts and airbags are able to fulfil their protective function to the full during an impact. Standard equipment includes a further improved suspension with adaptive shock absorbers. These automatically adapt to the current driving situation by reducing the damping forces when driving normally, thereby noticeably improving ride comfort. When taking bends at speed or during rapid evasive action, the system switches to the maximum damping effect so that the saloon is stabilised to best effect. Where seat development is concerned, Mercedes-Benz has added a new quality to a well established Mercedes concept, namely padded seat piping – a sophisticated and demanding upholstery technique that is only used by Mercedes-Benz. This involves the insertion of an additional foam filling under the artico or leather cover, and gives an immediate feeling of comfort and wellbeing when sitting in the car. The active multicontour seat package (optional ) includes newly developed multicontour seats with comfort head restraints and a two-stage massage function in the backrest that has proven highly successful in the S-Class. Mercedes-Benz has developed a climate control system for the E-Class which not only allows individual temperatures to be set in three zones – for the driver, front passenger, and rear passengers, but also offers different "climatisation modes". The new E-Class will be launched in Ireland in late summer.